We are not simply river trips organizer, whitewater trips is not only our job but it’s our profession which we take very seriously. He finds himself in the office as much as on the river nowdays to make sure for your safe, fun and memorable trip on the Himalayan Rivers. 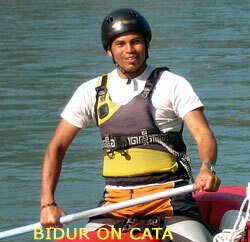 Bidur has started his rafting career in 1990. 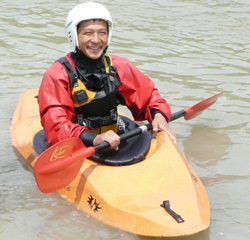 He has been organizing river trips on the rivers of Nepal since 1992. His idea is to be progressive: trying new crafts, exploring new rivers, learning and improving in all possible ways and all these with deepest dedication and respect to profession and the river. - 20 years of professional whitewater experience. 18 years in organizing and operating river trips in Nepal. Maila comes from Trisuli River Valley, village call Khauti which is West of Kathmandu on the way to Pokhara and Chitwan National park. Maila Thakuri is grown up next to classic river Trisuli. After finishing his high school education he has decided to continue his carier working on the river and be a professional raft guide. For Maila it was impossible just to look all these adventure passing by and not to try it, not to be involved in! That was a good motivation to become a successful raft guide. Maila started to guide on various rivers of Nepal successfully since 1997. Before guiding a raft by himself he was learning for several season sitting on a side of senior raft guide's boat and learn how to command and handle the raft and pass through the intesne rapids... Learning by doing...That is the way to become a professional guide! Guiding the raft or handling the supply raft (oar boat) - Maila is great for all! Maila has started to work with "WhiteWater Nepal" from end of 2006 and that and since then Maila is no just a Raft guide and also the leader of longer river expedition of Nepal. He is fantastic professional guide, fanstastic person and moreover he is fantastic cook! So, come and enjoy's Maila's delicious meals on the sandy banks of the rivers! Tak Man comes from Everest Region, Solukhumbu district, Kanku V.D.C. 9. His main dream was to become good trekking guide and he has been putting lots of efforts for his dreams come true. He is a person of great dedication. And he is a real Guide by his natural characteristics. Everyone who goes on the trip with him gets amazed by the way Tak Man does his job! He is well trained cook for the company as well and he loves cooking delicious outdoor meals in camping trekking and rafting trips. He started to work with us in 2001 and since that time he has learned so much and developed a lot. He is unbelievably energetic person with great desire to learn as much as possible using every day of his life for development. 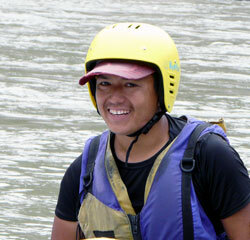 He is a very good safety kayaker and nowdays learning to be a raft guide. And his skills are developing really fast! He is a hard worker and everything what he does – he does with great motivation, right attitude and 100% involvement. Tak Man's non-stop energy and charming personality has been keeping all of us amazed! He makes sure that all goes smoothly on the trip, he takes care of everything. Before you can think of something – he already does it for you! Tak Man is very friendly and positive person. We are very happy to have Takman in our WhiteWater Nepal Family! Tak Man participated in sport river expedition on the Dudh Kosi (the steepest himalayan river) in October - November 2007, he participated in our latest expedition on Arun River (Upper Gorge) 2008 as well. Rajendra comes from Mechchhe, a small village east of Kathmandu. Rajendra was inspired by the example of his older brother Bidur Thapaliya. When he finished school he wanted to follow the steps of older brother Bidur and to be involved in adventure tourism, so in 1997 he started rafting with us! His great motivation of learning profession of raft guide brought its fruitful results: he has become a very good professional raft guide and kayak instructor. Besides guiding, one of his favorite aspects of being a river guide is to cook up great meals for all the hungry crew members. He loves to laugh and he is frequently the entertainer of the group. During monsoon season in Nepal he works as raft guide with our partner company - well known rafting company of Italy “River Land” (www.riverland.it), Rajendra guides on rivers in Italy, France, Slovenia. There is another side of being professional whitewater specialist – many people want to have your picture on their website. 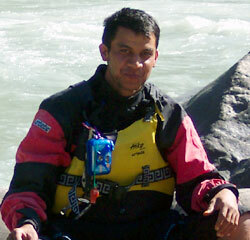 So that you can see Rajendra’s pictures on some websites of rafting companies - No wonder! Som is from Chitwan, near Royal Chitwan National Park. He has been working with us for 7 years with 12 years guiding experience in Nepal. One of his many interests is of the local cultures of the country. He provides a wealth of information about the customs of the people that live along the rivers of Nepal. 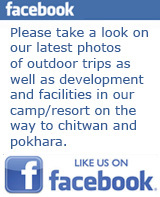 Being from Chitwan he is also very knowledgeable of the wildlife of Terai and other areas of Nepal. Som rows the supply raft on some of our longer trips as well. He is a raft guide in full meaning of this word: he insures your safe and exciting rafting brining you through great rapids, he gladly shares his deep knowledge of culture and nature of Nepal, he takes care of your comfort overnight staying setting the camp on the sandy bank of the river, he cooks delicious meals – he does his best for every group member to have safe, fun and memorable river trip with “WhiteWater Nepal (P.) Ltd.”. We are proud to have Som in our WhiteWater Team! Right now Som is in the UAE. But we are waiting for him to be back to Nepal to work on the rivers in the coming season.